The ACU key chains I made with Nick’s old uniforms are all gone, and there’s nothing left of of his field ACUs but tiny little scraps and threads.There are still lots of the shorter webbing/ACU key chains, though, and there are plenty of scraps for me to make more. My own soldier donated the uniforms he wore on missions, and I’ve been pretty busy taking them apart, stitch by stitch, so I don’t waste any fabric. I cut up what I can (some parts are pretty threadbare), and make more keychains. I’ve sold them at church bazaars and during our sew-ins; everyone loves them! If you’d like to buy a key chain (or two! ), just drop me a note, and I’ll send one off to you ASAP. 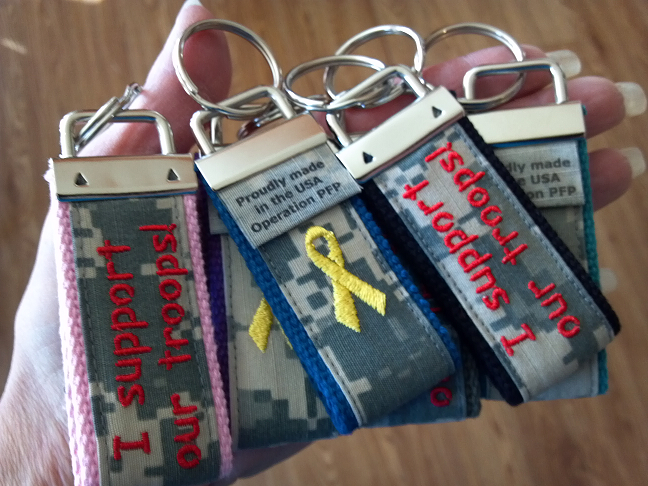 Show your support for our troops with an embroidered yellow ribbon keychain today! The shorter key fob is made using ACU sewn onto heavyweight cotton webbing and is available in pink, purple, Army green, teal, gold, medium blue, and black. 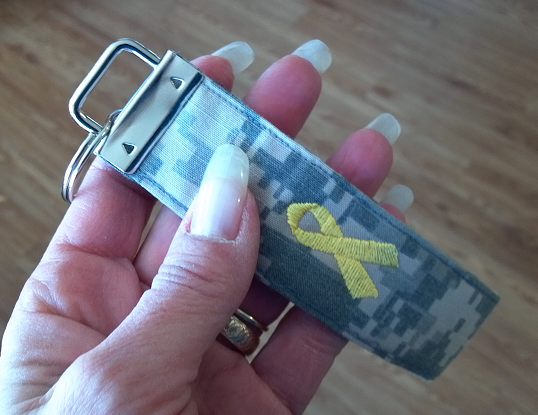 I have embroidered a yellow ribbon on one side; the other side is embroidered with "I support our troops! ".